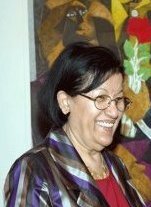 Rabab Nemr is a veteran Egyptian artist whose work has been exhibited consistently since her graduation from the Fine Arts Faculty in Alexandria in 1963. She later earned a doctoral in Art from the San Fernando Academy, University of Madrid in 1977. Nemr's work has always been quite intricate in relation to its size. Her attention to detail is magnificent, using miniscule strokes of a radiograph pen in order to create large pieces that convey the soul of her hometown, Alexandria. The artist mixes between solid black and white works, and those with colour, and continues to thrill with her larger than ever artworks of incredible detail. 1963 obtained Degree in Fine Arts- University of Alexandria. 1977 gets nominated as a professor of Arts issued by San Fernando Academy of Madrid University, equivalent to the PHD given by Egyptian Universities. Member of Fine Arts Syndicate, and of the "Atelier" Committee of Arts and Literature in Alexandria. 1981-1982 obtained the Merit Prize in Drawing from the General National Exhibition. Participated and represented Egypt in many private exhibitions nationally and internationally. 1994 obtained the Merit Prize in Drawing from the Sharjah Biennale. 1997 obtained Prize in Drawing from the Fine Arts Competition, in its first round. 1997 obtained the Jury Prize in the 8th Cairo International Biennale. Museum of Modern Art - Cairo, Museum of Modern Art in Mahmoud Said's Center-Alexandria, Museum of the Faculty of Fine Arts, Alexandria, Opera House - Cairo, Collection of the Cairo International Conference Center. Museum of the Arab Institute - Paris, Museum of Titograd, Yugoslavia, Museum of Islamic Modern Art, Amman - Jordan, Collection of the Superior Council of Arts and Literature, Kuwait. 1984, 1986, 1988 Akhnaton Gallery in the Center of Fine Arts in Zamalek, Cairo. 1984, 1986 Ragab Art Gallery, Cairo. 1984 Mohammed Nagy Gallery, Alexandria. 1986 Al Areesh Cultural Palace, Al Areesh. 1994 Italian Cultural Center, Cairo. Participates yearly in the General National Exhibition of Contemporary Art. 1998 Khan Maghraby Gallery, Cairo. 2000 participated in the Annual Salon of Small Art Works. 2000 participated in the National Exhibition. 2000 participated in the International Women's Day Exhibition, Cairo. 2000 participated in "Mawkeb Il Noor' Exhibition, to celebrate the 1400 years of Islam in Egypt. 2005 Black...white...color...,Zamalek Art Gallery, Cairo. 2007 Zamalek Art Gallery, Cairo. 2008 April, Egyptian Women Artists Exhibition, Amir Taz Palace, Cairo. 2008 "Humanity" Zamalek Art Gallery, Cairo. 1987 Abeya Qatami's Art Gallery, Kuwait. 1991 Exposition of Egyptian Art, Academy of Egypt, Rome, Italy. 1992 Municipal Gallery, Espolito, Italy. 2000 Al Dhahia Art Gallery, Kuwait. 1991 Exhibition of the "Egyptian Woman and Creativity", Rome, Italy. 1992 "Contemporary Egyptian Art" Exhibition, Rome, Italy. 1990 Art and Football Exhibition, in occasion of the World Cup that was held in Italy. In this Exhibition, 24 artists representing countries that participated in the Mondial exhibited their work. Later the works were shown in Akhnaton's Center in Zamalek. 1994 participated in "Parallels" an exhibition that included 19 Egyptian Artists and 19 Italian Artists.